What are exactly the thirteen points in the Bolivia-Chile agenda? 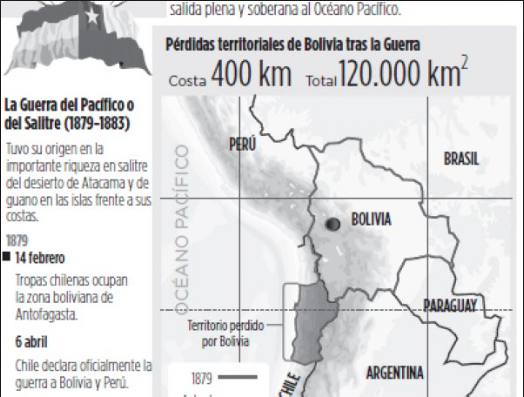 Bolivia has a serious and long-lasting pending issue with Chile. Other issues: Agreement to allow paid activities [work] for consular spouses, administrative and technical staff; an agreement on social security issues; Chile cooperation for the implementation of Bolivian elections abroad. A crucial issue to keep and enforce this agenda is that current political party in power, starting from the coca-grower caudillo should be to learn how to keep their mouth shut. Speaking without control and just out of their guts of the moment, does not lead anywhere. To read in Spanish an interesting article that summarizes our ordeal, and present status, read what Alejandro Veliz wrote in El Diario, yesterday [02/21/2015], use this link. This entry was posted in Bolivia, Business, Economics, Energy, Environment, Mining, Politics, Social Unrest and tagged 1879 Pacific war, Chile, demagogue, diplomatic relations, Foreign Affairs, invasion, public policy failures. Bookmark the permalink.